One Hundred and Three Floors! 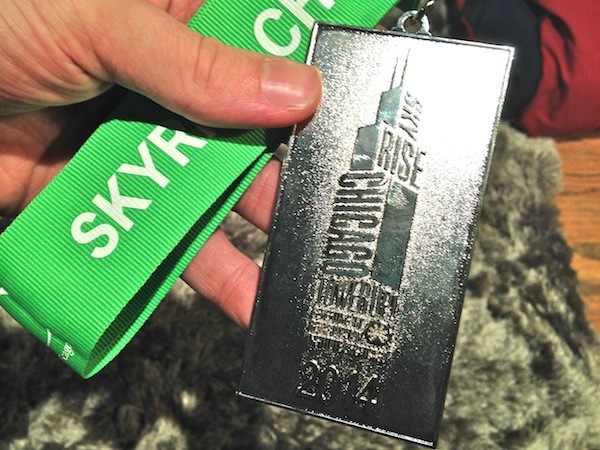 (SkyRise Chicago Race Recap) | Keep It Up, David! 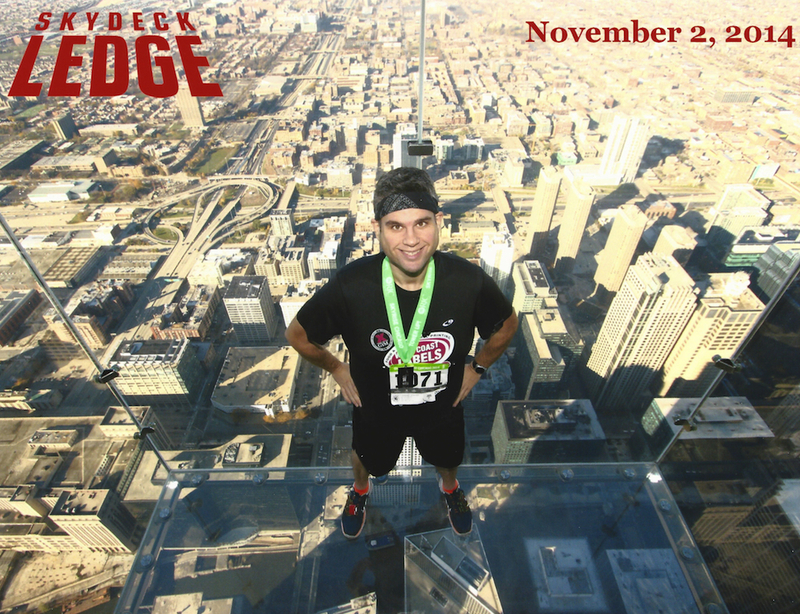 The ledge on the 103rd floor of the Willis Tower in Chicago! 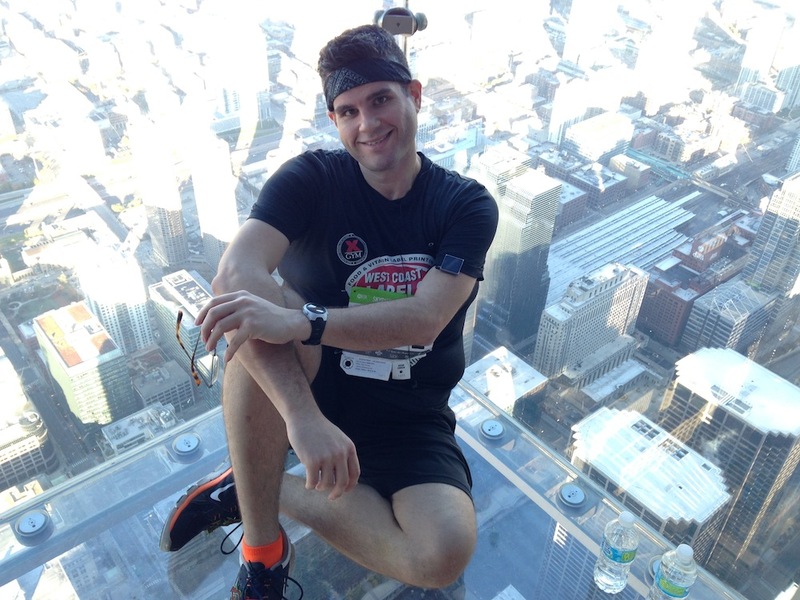 I was exhausted because it was my first time competing in SkyRise Chicago, the annual race up the tallest stairwell in the country. It was a killer. This was the first race where I officially competed in the Elite category, which meant I started with the first wave of runners at 7am. This required waking up at 5:15am, and it was dark and cold – around 30 degrees. We scraped frost off my sister’s windshield. 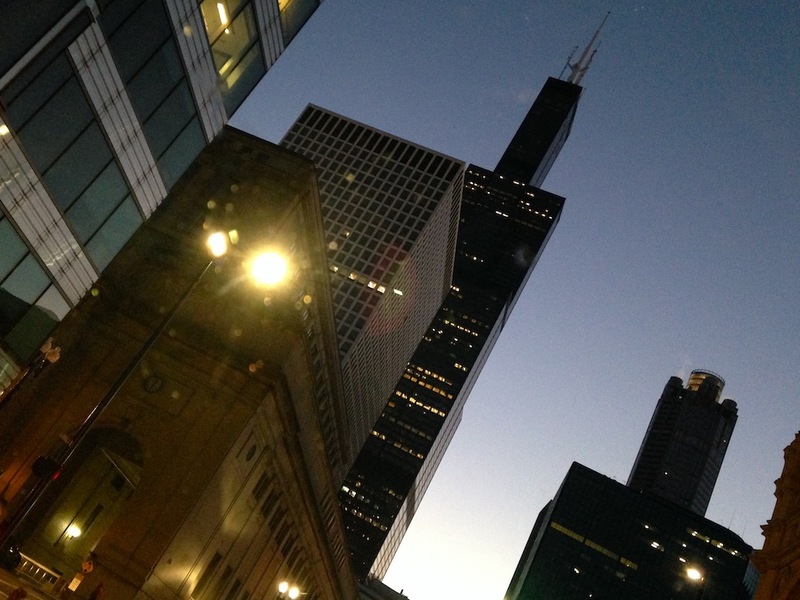 Daylight was just emerging as we approached the looming Willis Tower. 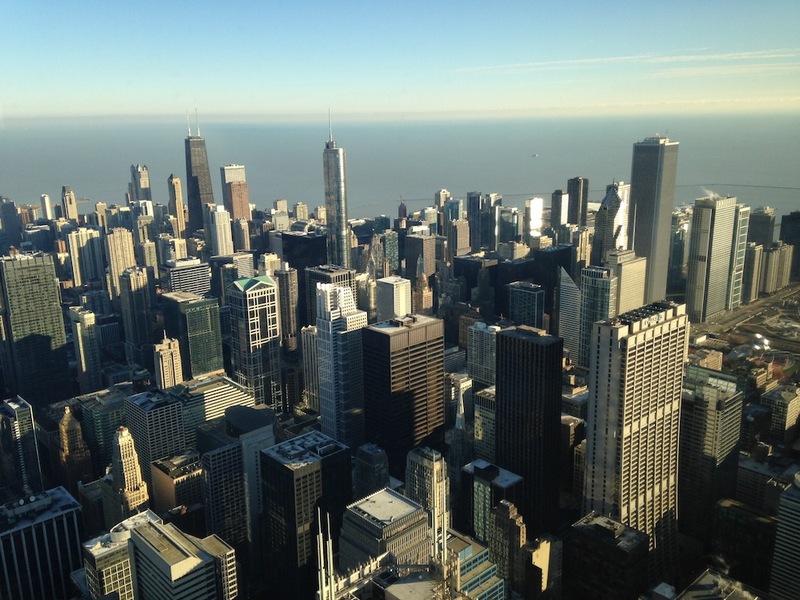 Some facts and figures: The Willis Tower is 1,450 feet tall. The top of the two antennas reach 1,730 feet off the ground. The building has 110 stories. It’s tall! My friend Lisa and I coincidentally got consecutive bib numbers! Racers started one at a time, every five seconds. I was the 61st racer to enter the stairwell, 5 minutes and 5 seconds after the race officially began. Every single warning that I had heard about the stairwell was absolutely correct. The stairs were steep. Each individual step was about 1/2″ higher than the other buildings I’ve raced in, and while that may not seem like much, it adds up. Quickly. 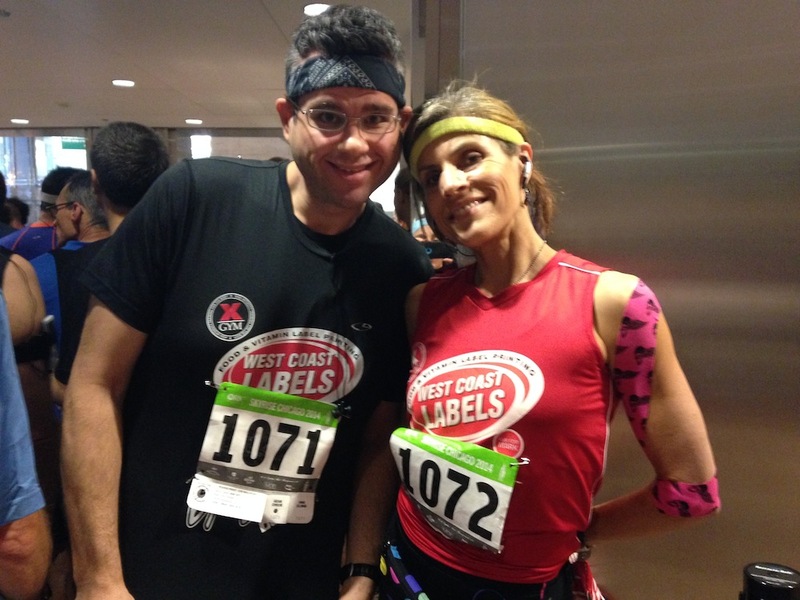 For the first 10 floors, I tailed my teammate Bob, who entered just before me. Bob is faster than me, and set a good pace. Bob broke out ahead when, between floors 10-14, there was a mini-mob of about 6-7 racers, all jockeying to pass each other, and we got separated. From that point on, I set my own pace. I started feeling the burn in my legs and lungs around the 30th floor. I tried to focus on my footwork and landings, even though by that point I couldn’t double-step nearly as much as I wanted to. There were volunteers every other floor, cheering us on, fanning us with giant signs. I made a point to smile at all of them, which was instrumental in helping me stick to one of my goals for this race, which was to stay positive from start to finish. 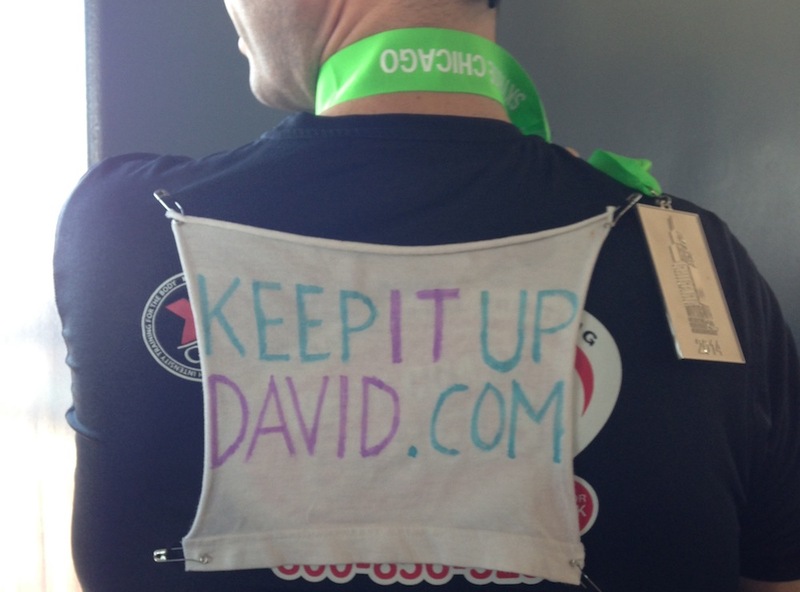 I had a “Keep It Up, David” sign pinned to the back of my jersey, and a bunch of volunteers throughout the race cheered me on by name. 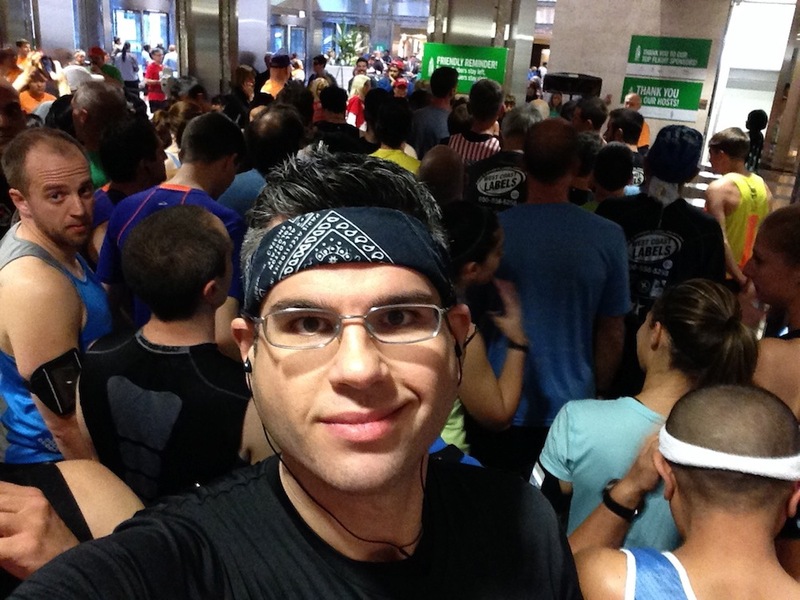 RELATED CONTENT: Check Out My Race Page, with Links to All my Race Recaps! Another trick I employed was to focus on reaching milestone floors, like 26 (1/4 finished! ), 34 (1/3), 52 (1/2), 68 (2/3), and so on. The organizers also had great signs up on certain landings that provided motivation based on other landmarks. “You’ve now climbed the equivalent of the Statue of Liberty,” said one of them. They also had them for the Space Needle, Gateway Arch, Eiffel Tower, and a couple more. This climb pushed my heart into new territory. Every time I checked my heart rate monitor, I was in the mid-to-high 170s. I slowed down considerably during the second half of the climb, and even then, when it felt like I was crawling along, my heart rate didn’t fall. The stairwell narrowed during the final 15 floors. By this point, it was adrenaline and determination that kept me going, because every inch of my body ached and throbbed. When I realized I was in the home stretch I recommitted myself, and tried to double-step as much as I could. It was then that I saw a number on my heart rate monitor that I had never seen before: 181. Holy crap. RELATED CONTENT: Racing Up The Tallest Building in Los Angeles! 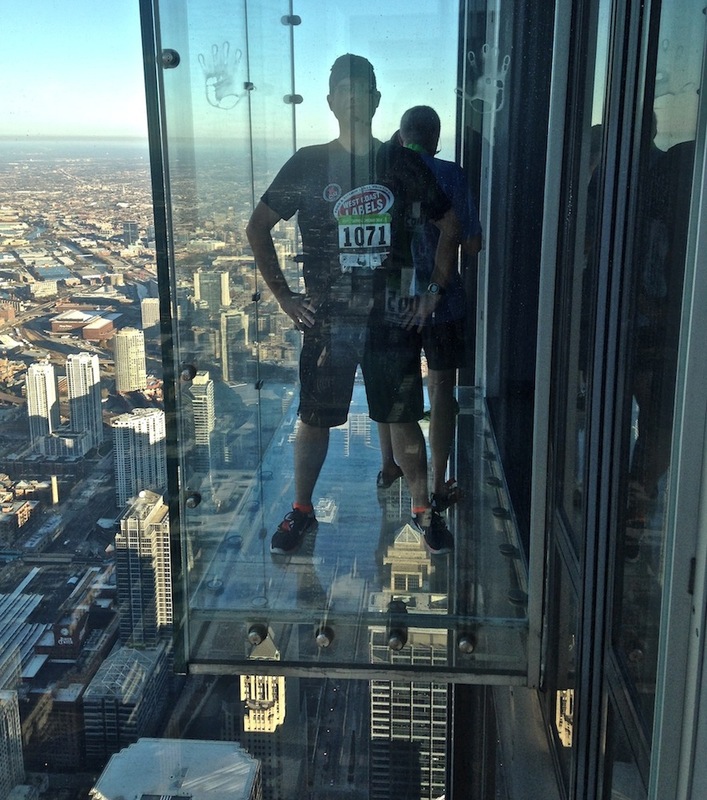 My memory of emerging on the 103rd floor is a blur of exhilaration, sweat, and fatigue. I was handed a finisher’s medal and a bottle of water, and I quickly found a corner so I could lay down until my heart settled back into the normal range. A few minutes later, I was able to get up and take in the view. 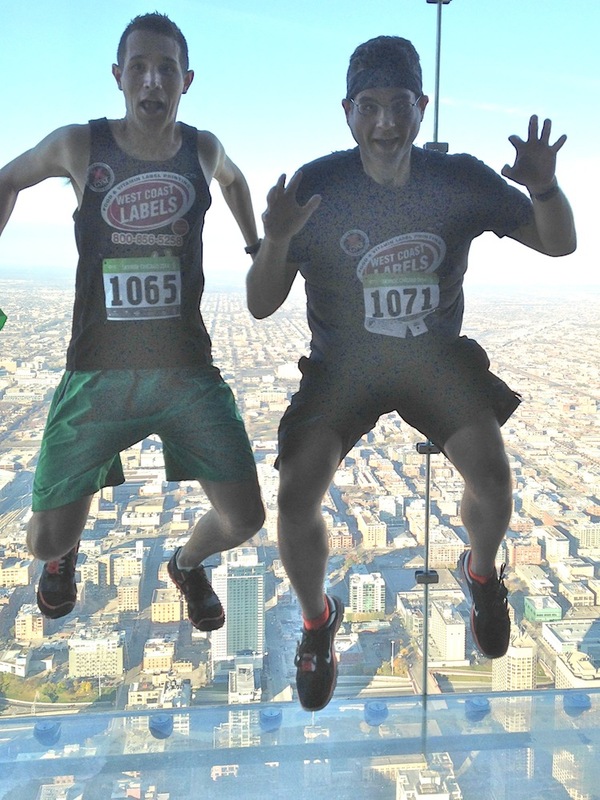 When you’re 103 stories off the ground, it’s all about the view! The best part about the Skydeck (which is what the 103rd floor is called) are the four glass ledges that extend out from the side of the building. I’ve been out on them before, with my sister a few years ago, but it felt different this time, knowing that I had traversed, on foot, the entire distance from the ground to where I was standing. How cool are these ledges?! 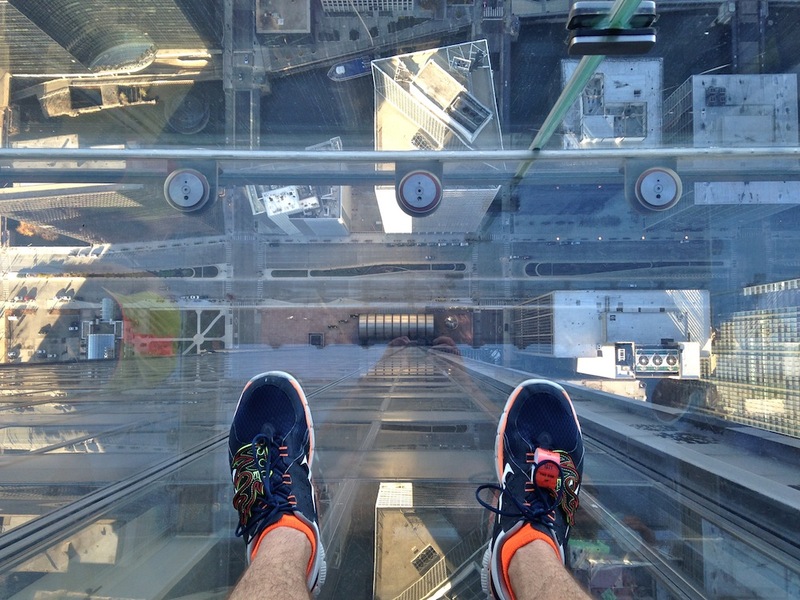 Even the floor is glass, so you can look down, past your feet, and see South Wacker Drive 1,353 feet below. That’s my finisher’s medal in my left hand. It’s the nicest medal I’ve ever gotten at a stair race. Oh, and here’s some great news: my foot, which I had injured just nine days prior, felt absolutely fine. No pain, no aggravation, nothing. I didn’t even think about it at all until some friends, at the top, asked about it. By the time I made it back down to the lobby, race results were available. I went into the race with three goals: 1) Don’t stop. 2) Stay positive. 3) Give it everything I had. I already knew that I had crushed all those goals, so I was proud before I reached the results table. That pride was magnified when I saw my time: 27:49. 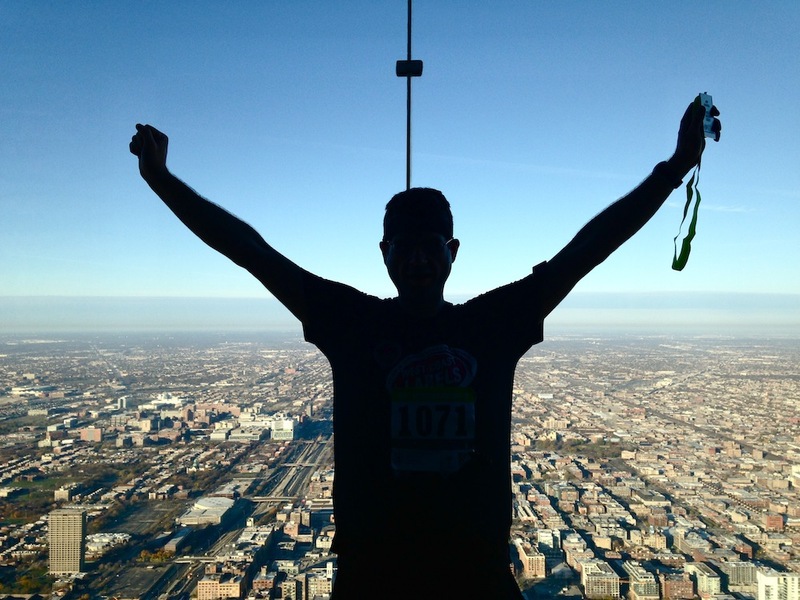 I climbed 103 stories in 27 minutes and 49 seconds! I finished 125th out of 314 in my division (Men 30-39). I finished 708th out of 2,622 total finishers. I finished 4th out of 14 finishers with the last name Garcia (beating another guy also named David Garcia). After the race, I went with a bunch of friends to get some breakfast at a place down the street. As I walked away from the Willis Tower, I took one final look up at the top. I can’t fully describe the sensation that came over me. I got goosebumps. 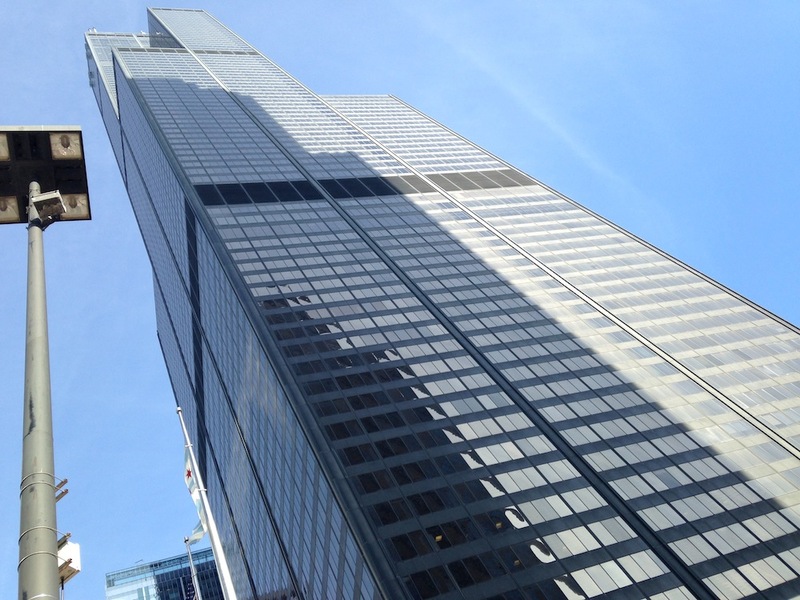 Willis Tower is a landmark and an icon, the tallest skyscraper in a sea of Chicago skyscrapers. And I felt a new sense of connection, and even ownership. 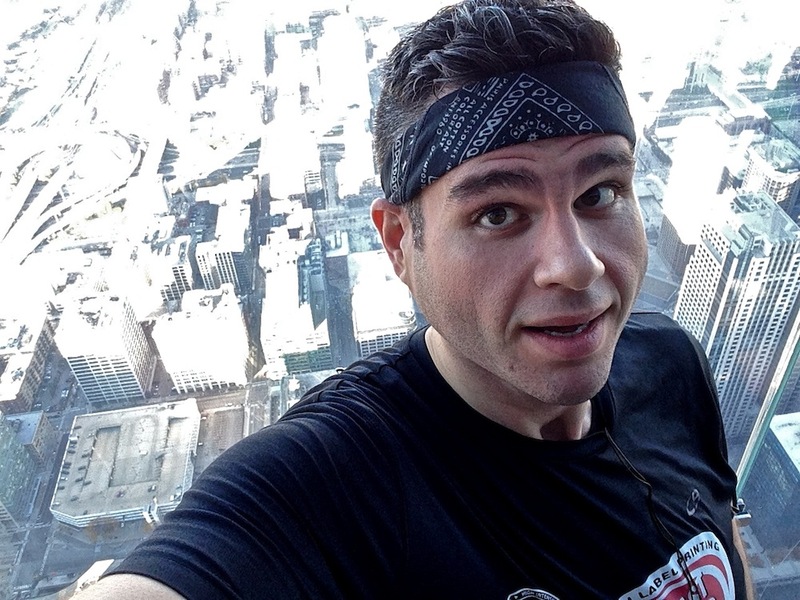 There are 2,115 steps from the lobby to the 103rd floor, and I conquered them. All of them. This building may be the 8th-tallest freestanding structure in the world, but it’s no match for me. 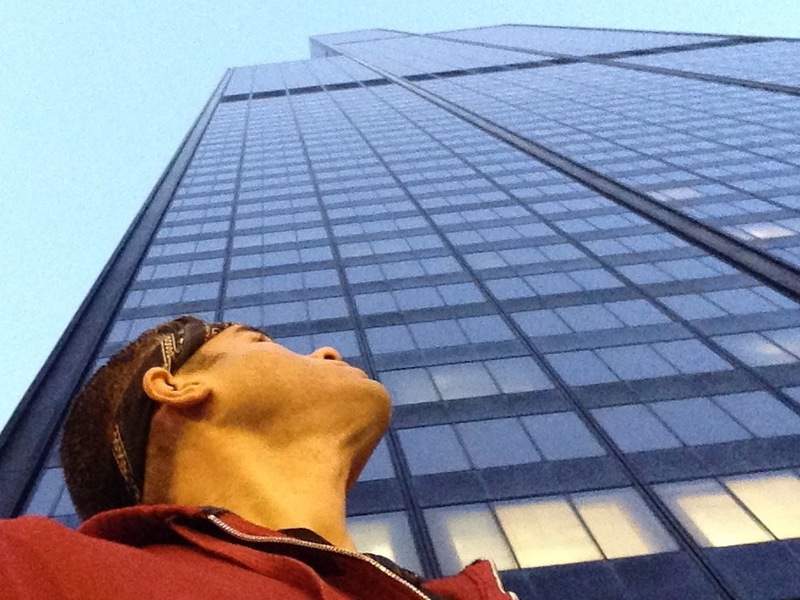 The Willis Tower is no longer just a giant, imposing structure… it’s my giant, imposing structure. I won’t be able to look at this building ever again without being reminded of my own hard work, resolve, sacrifice and strength. PS. A great big thank you to my donors: Melissa, Anne (and her mom), Joanne, Karen and Megan. You guys rock! Thank you for your help in making this race a reality for me. This entry was posted on Monday, November 3rd, 2014 at 12:02 am and is filed under Uncategorized. You can follow any responses to this entry through the RSS 2.0 feed. You can leave a response, or trackback from your own site. Was just thinking about you and woke up to see your post-Congratulations! Great job! Wow! Super cool pictures. Nice Job! Great accomplishment, David! That silhouette shot is spectacular! Definitely the coolest I’ve ever seen on that deck! I am so incredibly jealous, but very happy for you! Thanks, George! Hope your recovery is going well. I’m sure I’ll see you in the stairwell soon! Minor setback–fell off my bike last week landing on my knees, but slowly recovering. I’m doing jury duty in downtown L.A. tomorrow. In all likelihood, I’ll be climbing City Hall on lunch break (albeit at a snail’s pace). If I have to serve late on Wednesday too, maybe I’ll swing by Fig@Wil. If you ever get around to climbing City Hall, I’d also highly recommend the “OJ Trial” bldg. where I did my jury duty. It’s only 19 floors in the main stairwell, but unlike CH, you can go real fast since they have a consistent design, no doors, no zigzags. CH is like a jungle; OJ’s like a racetrack. I was able to do 8 laps on Tuesday & 2 yesterday. Jury duty ended up being short but entertaining since comedian/actor Orny Adams was with us. Anyway, have a great time at the CFF race next week! Wonderful tips, George! Have yet to make it to the civic buildings, but know I feel like I have insider’s intel. 🙂 Sounds like you’re doing pretty well if you have do 8 laps! Keep it up! Hard work and resolve, you indeed own this one. Great work David! !